I was quite Lucky that with Lily I have never had to worry about her dribbling. She went through all her time as a baby without being a big dribbler and teething was a doddle for her. But now its come to her being a toddler she has started to drool like crazy! Worse than that she even was starting to get a terrible dribble rash on the chest. I didn't really have many dribble bibs as never needed to buy some but now I really did need some. This is where Funky Giraffe Bibs came to the rescue. They kindly said they would send me 5 bibs of my choice to review. The choice on the website is unbelievable. They have so many designs. They don't call them funky giraffe for nothing. The designs are really funky! 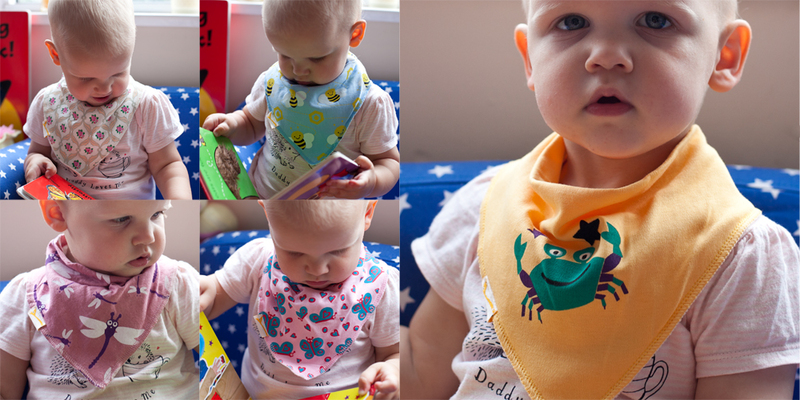 I was super excited to be getting Lily some stylish bibs with such fun designs on. But I really did struggle to choose. In the end I found my designs. I chose some that were girly, and pretty with flowers on and butterflies, but I also chose one with a crab on it as its perfect for the summer look, and chose one with Bee's on as Lily currently Loves Bee's. The bibs have 2 fastenings at the back so they can be for a smaller or larger fitting. They also have different materials. One which is more lightweight for summer. I got 3 summer bibs and 2 of the thicker ones. 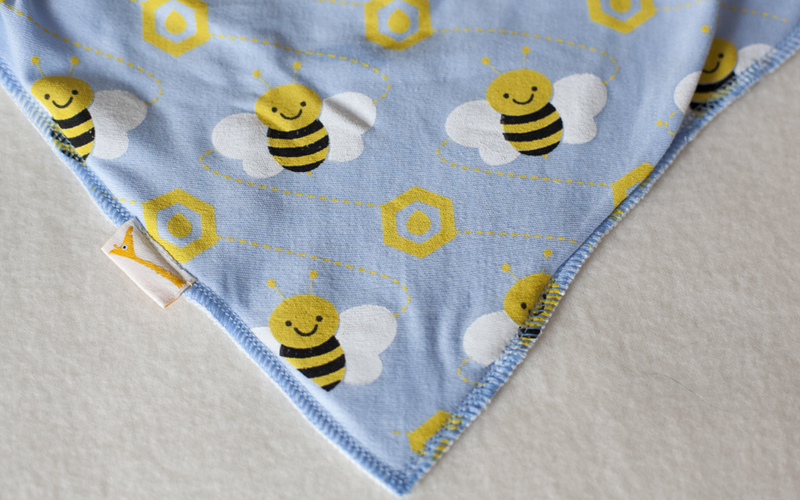 The thicker bandana bib has a thick fleece backing so the dribble doesn't soak through. I love the fleece on the inside. Its lovely and soft. The summer bibs are made of cotton and have a thinner backing which make the bibs a little lighter and more breathable. Again it is lovely and soft in the inside. So I have been using the bibs over the last few weeks and its only after using them have I realised how much Lily was drooling. Over the day the bib would get damper and damper. 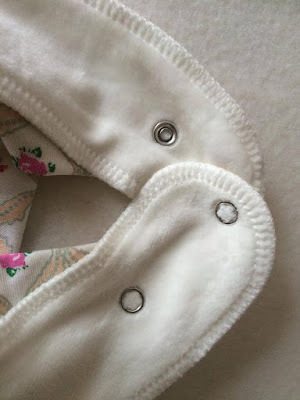 But one great thing about the bib getting damper was that her top was dryer. The bibs did a great job of soaking up the drool and keeping her clothing dribble free. Another thing I noticed is that Lily didn't try to take the bibs of once so they must have been really comfortable to wear. Also with them having poppers instead of velcro they stayed on and she wouldn't of been able to pull them off very easily. The material is really soft around her neck and so I didn't have to worry about it rubbling against her skin. After wearing them all our favourite design was the Bee's. It keeps Lily happy being able to see the bee's all day and I love how bright and colourful it is. The bibs retail at £4 each which I think is great value per bib. You can see all the designs and buy the bibs at the Funky Giraffe Bibs website. As well as bibs, Funky Giraffe have just started bringing out hair bands and they sent one along with the bibs for us to have a look at and try. Lily doesn't actually have much hair and bows don't really suit her yet but I was definetly interested to see what the hair bands were like to use in the future. 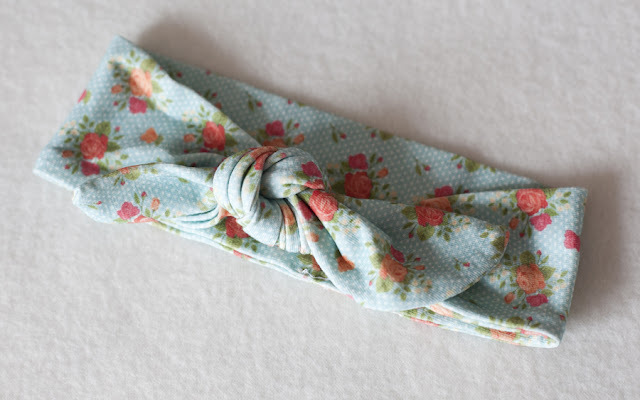 The hair bands are very cute and there is a nice selection of different designs and colours. I went for the Coral Flowery Rabbit Ear Headband. 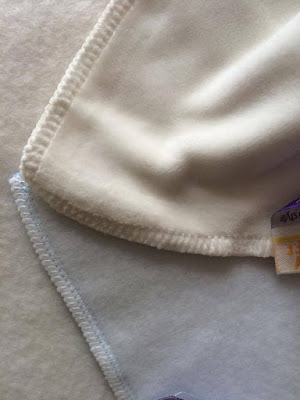 The hair band is made of such a lovely material which is really soft. Its also really stretchy and so would fit a range of young ages. I loved the design to. The colour and the floral pattern is really pretty. Unfortunately I couldn't actually get Lily to keep the bow on her head long enough for a photograph. She isn't used to wearing them yet and with not having much hair I'm sure it feels strange. But I'm definetly putting this a side for when she is a little older. You can buy the head bands from the accessories section on the website. Now I have a chance for you to win some bibs of your own. Funky giraffe will let you pick 6 bibs if you are the lucky winner. We loved the football one perfect for the time of year. I love the Green White and Yellow Daisies design, it's so colourful and sweet! I adore the Vibrant Red Smart Little Tie Special Occasions Bib. I love the Personalised Bandana bibs! I adore the multi colour dinosaur bandana bib! The multi colour dinosaur one is cute! The dinosaurs! I like that they have a pink dinosaur, as well. 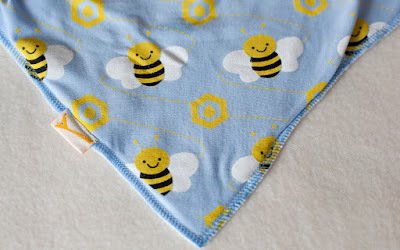 The Blue Busy Bee Bandana Bib is my fave!